The Whole Enchilada Special Offer! ALL Our Packs! GET 20%-MORE-OFF NOW! USE CODE: FLUENT AT CHECKOUT! ENDS MONDAY! Learn ALL the Real Spanish We’ve Got & Get Fluent Faster! Includes all the products sold in our store, with full transcripts & essential notes for all 200+ Inspired Beginners, Intermediate, Advanced, Gold & ‘Conversations’ episodes. Plus, The Real Spanish Phrase Book & Audio Guide, & Real Spanish Control. BONUSES! Exclusive extra audio bonuses, Instant digital access & Full 60 Day Money-Back Guarantee! “This is the single best investment I’ve made in my self-education approach to learning Spanish.” – James R.
Over 200 worksheets packed with the real, genuine Spanish we love to teach at Notes in Spanish! You’ll be fitting in with the locals in seconds! 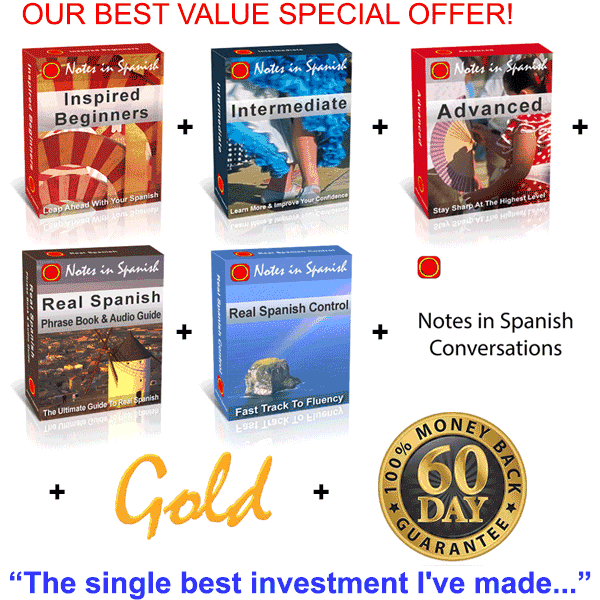 Learn more real Spanish and get fluent faster with this wealth of Spanish learning materials! Special Bonuses Included In This Pack (Worth 99 Euros)! Bonus 1: How to Sound Really Spanish Mp3 – words and phrases that will let you fit in with the locals in seconds. Bonus 2: Tips and Tricks Podcast Mp3 – Top Secret (and highly effective) ways of learning a lot more Spanish, a lot faster! Bonus 3: Inspired Beginners Audio Flash Cards – Explode your vocabulary and pronunciation with these exclusive audio flashcards. Bonus 4: The infamous ‘One Hour Private Lesson With Ben and Marina’ Audio – may be worth the price of the Whole Enchilada Pack alone! 5 Great Reasons To Get This Pack! You learn everything we’ve got to teach you! You get really fluent in REAL Spanish, much faster! Our Simple, No Risk, 100% 60 Day Money-Back Guarantee! ¡A Por Ello! – Go For It! Hit the ‘Add to Cart’ Button Now and Get Fluent Fast! 38 reviews for The Whole Enchilada Special Offer! ALL Our Packs! The worksheets were as I expected or better. They add to the podcasts as it is easy to miss things when only listening or not know how a word is spelled, for example. As great as the podcasts are, the worksheets do make an enormous difference. If you are serious student and want to get the most you can from this program, you must buy the worksheets. The written reinforcement from the translations and the vocabulary make this a great learning tool. Buying the worksheets turned out even better than I had expected. My Spanish has improved so much over the last year. But it’s worth saying it didn’t take a year to see the improvement! I’d recommend this to everyone who is learning Spanish! I use the podcasts and worksheets from Notes in Spanish especially for my listening and comprehension skills. It’s also a good way to learn grammar rules in a fun way! I’ve been in a rut with my spanish for a while, looking for a new course or class. Notes in Spanish has helped for several reasons. With a set length, and beginning and end, I know I can do them each day. Having got on well with the podcasts the transcripts were great as well – I just dip in and out of different pages at random to test myself/refresh my memory. That works too. I’m already recommending Notes in Spanish to people who want bite sized ways to learn – and a real structure to follow. I’d recommend this to anyone serious about leaning Spanish and especially to anyone learning on their own. The real key to moving forward has been the worksheets. I am able to check my audio comprehension with the exact dialogue, and then practice and test myself with the accompanying exercises… invaluable! Really great podcast and very helpful worksheets! I had been paying a private tutor for 18 months – I now use these instead and he uses them for other students! Excellent, helpful resource -it is helping me to actually talk to Spanish people! Easily a worthwhile investment for boosting your Spanish in all respects. Compared to the potential cost of learning this much through lessons I’d say the resources are a bargain. I”ve still got loads of sheets to get through, but certainly so far being able to read as well as listen has particularly helped me focus on sentence structure and many of the more ‘real life’ expressions. Definitely recommended. The worksheets have been really helpful and add a lot to the podcasts. It´s great to listen back to the podcasts after reading through the transcript and seeing the words that I missed on the first couple of listens. The worksheets and transcripts are a real help to learn Spanish much better. I like it very much that in the podcasts Ben sometimes makes small mistakes and Marina corrects him in such a lovely way. The length of the podcasts with the worksheets make up a lesson of a good timespan, explanation of grammar is helpful. I am glad I bought the whole pack, so there are a lot of goodies in store for me. Easily the best resource I have used for learning Spanish. I always tell my students to listen to the podcasts over and over again while at home. The worksheets are very useful. I bought the Whole Enchilada about 1 1/2 years ago and have been using the material just about every day. The worksheets are worth every penny! Amazingly helpful resource. So generous with content and time. You need to put your own work in of course but once you commit, everything is there for you. I’ve still not got to the end and I got this a lot long time ago. Thank you so much. My life is so full that there is little time to myself, so I have not been able to make the most of my Notes in Spanish, but I read and listen to Ben and Marina whenever there is a podcast, and when my grandsons move on to University in a year or two, I will become a regular student of the most friendly, inclusive, genuine language learning treasure on the Internet – so enthusiastically taught. Thank you both. Superb package all round. Well thought out, interesting topics, good balance of material, and a boon to learning Spanish. Also the other add ons and e-mails of interesting bits and pieces are great. This is an absolutely first class aid to learning Spanish. I can not recommend Notes in Spanish enough. It keeps the learning interesting, far better than any other method, plus it means I can visit my friends in Spain and have them be surprised at the progress I have made. Very highly recommended. Great to listen to on long journeys. I find if I listen to each episode 3 times over a few days then I’ve got it. I listen once then look at the transcript before I listen again. I thoroughly recommend them. The combination of the audio and transcript is fantastic. I have found the podcasts an excellent means of learning spanish. The worksheets enhance this learning even more and the topics covered are wide ranging and very interesting. Highly recommended. Learning through listening to conversations is wonderful! The ipods along with the transcripts are perfect. I’ve completed the beginner and intermediate, and am now working on the advanced. Thank you guys so much for doing these! The best Spanish learning resource on the internet. I started with the Gold series and ended up getting The Whole Enchilada, when it was all said and done. Learning a new language or advancing your proficiency level is not easy. ‘Notes in Spanish” is a great tool. I have gone from Inspired beginner to practically fluent with the help of this program. Ben and Marina are smart and witty, I feel like they are friends; I have gotten to know them so well. There is an advantage to hearing Spanish spoken by a Madrilena and then, by a really good student. i recommend the free podcasts to anyone as they are valuable and readily available. The Gold series are fabulous and I review them often. I am an Nurse in California so I am exposed to quite a bit of American Spanish. The Spanish from Spain is a bit different and it is fun to know the difference when I over hear European travelers. I have been told by accent is quite good, but what do i know. I have used many on-line and self-study programs and this is my favorite. It is difficult to add anything to the other reviews. I am now on the intermediate podcasts. I look at the transcript before listening in order to work through any translations I’m not familiar with. Then I listen to each podcast several times. Buying the whole package seemed like a bit of an investment at the time, but now I can’t imagine being without the transcripts. This is the single best investment I’ve made in my self-education approach to learning Spanish. I actually bought all the NIS products individually, over time, and that’s why I highly recommend The Whole Enchilada as a very economical way to acquire all these great resources. My Spanish dramatically improved after finding Notes in Spanish, and I continue eagerly anticipating every new audio and video that Ben and Marina publish! This is a great way to learn spanish at one’s own pace. Also Ben and Marina are very happy people and it is always enjoyable to learn from them both…. Hugely helpful resource that I return to time and again. It has advanced my spanish hugely. This is from Mike, I sent you the PDF of the Camino de Santiago. Hope this helps. I bought this product a few months ago and it is an enormous help. The combination of a native Spanish speak and her English husband is just perfect. I am working on my listening skills and I spent 20 minutes a day listening to this couple chatting in Spanish about interesting subjects. The worksheet in Spanish is a great help as are the tips and explanations. Five-star product at a great price. Great product, really happy with it, and excellent value. So much useful material, it’ll take us years to work through it all. Which is great! Buying the whole enchilada was the best decision I made for learning Spanish. I took my time using them but noticed my listening skill had improved when watching rtve. I came across Notes in Spanish years ago while searching for Spanish audios to improve my old rusty bit of Spanish. I listened to a lot of the beginners and loved it. Now I finally gave in and bought the whole enchilada! It DOES make a difference and help you memorize better, particularly when combined with any free grammar you can find online and/or Duolingo. Ben and Maria are so charming and you get a lot of useful and interesting cultural information about Spain while learning the language. It’s definitely one of the best investments I have made. The worksheets/transcripts are such an advantage to learn Spanish alongside the podcasts. I am able to perfect the speech having seen it in print as well as hearing it, and can visualise the written word from my memory when I’m out and about. I make many Spanish folk smile when I come out with ‘Real Spanish Phrases’. It’s a lot of fun learning g with Notes in Spanish. Totally recommend. My wife and I bought “The Whole Enchilada” to help with our Spanish now we’ve moved to the North of Spain. We’ve been working through the beginners audio and worksheets so far and our Spanish neighbours have noticed an improvement in our vocabulary and our confidence. Must be working! Muchas gracias Marina y Ben!